At crime scenes, personal protection is of the utmost importance for the health and safety of law enforcement employees. Safety is not something to be taken lightly. 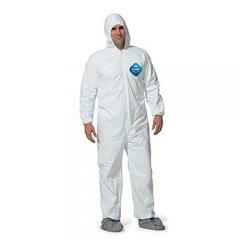 Tyvek coveralls are designed to protect the person and the clothing from blood, chemicals and other liquid hazards at crime scenes. The OSHA regulation, 29 CFR 1910.1030, requires employers to provide appropriate protective apparel, which under normal conditions of use, does not permit blood or other potentially infectious materials to pass through.All of our protective clothing is made of Tyvek® materials and is available in two different grades. Tyvek® 1424A (white) and Tyvek® QC (yellow) were tested for the permeation of blood under splash and pressure conditions. If blood is only splashed with no pressure applied, both grades of Tyvek® have a break-through time of more than eight hours. However, if there is pressure involved, such as kneeling or leaning in blood, choose the Tyvek® QC. Blood will only penetrate the Tyvek® QC after pressure greater than 2 pounds per square inch is reached.